Anders Behring Breivik absorbed all of his murderous ideology from the internet. It wasn’t Christian fanaticism or right-wing fanaticism or even anti-Muslim fanaticism that drove Anders Behring Breivik, the man who slaughtered about 90 people in Norway on last Friday, into madness. It was Google. Hungry for explanations why the 32-year-old detonated a fertilizer bomb that left eight dead in the heart of Olso and then shot dead about 70 more at a youth camp run by the Norwegian Labour Party on a nearby island, the media have been trawling through a 1500-page document that Breivik posted to his Facebook friends before his killing spree. He titled it “2083 – A European Declaration of Independence”. It’s an ill wind that blows nobody good. This calamity has been used to vindicate condemnations of right-wing politicians, opposition to Muslim migration and Christianity. But triumphantly plucking damning quotes from his 1500-page rubbish heap proves nothing. He speaks with the gravitas of both a theologian and a new atheist: “As for the Church and science, it is essential that science takes an undisputed precedence over biblical teachings. Europe has always been the cradle of science and it must always continue to be that way.” He rails against the destruction of family values and wants to implement a one-child policy in the developing world to save the environment. It has all been compiled with Wikipedia’s air of no-nonsense academic detachment, from its analysis of Muslim demography to description of how to purchase weapons for a mass murder. … Surfing the internet gives you facts, not values to live by. You can only learn morality and self-knowledge through commitment and engagement with other people, not by googling. At a time when families are falling apart and many children are growing up without engagement with their parents, how many more Breiviks are out there? Madrid, Spain – World Youth Day organizers said July 25 that the independent catechesis sessions offered by U.S.-based media producer Michael Voris during World Youth Day 2011 are not approved by the event. Voris responded with puzzlement that the announcement was made, stating that his organization has never represented itself as linked to the event. “Participants in the World Youth Day 2011 Cultural Program must be recognized and endorsed by the bishops and episcopal conferences of their respective countries,” read a July 25 statement from the event’s organizers. There had been “some confusion” about Voris’ affiliation with World Youth Day, organizers said, further noting that “Real Catholic TV” and Michael Voris’ catechetical session “No Bull in Madrid” have not received endorsements from the group’s local bishop—Archbishop Allen Vigneron of Detroit—or the U.S. bishops’ conference. They are “not in any way recognized or approved” by the official event. The Pontifical Council for the Laity selects and invites only bishops from around the world to conduct catechesis sessions at World Youth Day, the statement explained. Participating organizations in the World Youth Day 2011 Cultural Festival are selected because they “promote the authentic teaching and unity” of the Catholic Church and have received the required endorsements. Voris questioned why the announcement about his event had been made. “We never said we were part of the official World Youth Day. I guess I’m puzzled as to why the announcement was issued,” he said in a July 25 interview with CNA. He described himself as “a Catholic in good standing” with a theology degree from the Angelicum in Rome. “Nothing that we have ever said has been challenged with regard to Church teaching,” he said. 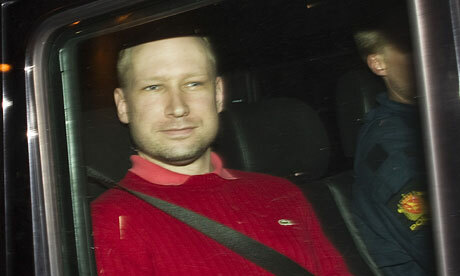 Anders Behring Breivik Facing a 21 Year Sentence Only! And that for killing so many people?! Friday’s twin attacks in Norway that killed 76 people have sparked growing outcry at the country’s penal code, under which even the man now accused in the mass killings would face a maximum penalty of only 21 years in prison if convicted. If found guilty in the massacre and given that maximum sentence, Anders Behrin Breivik, 32, would serve roughly 100 days in prison per killing. “So many innocent people have been killed that I think he doesn’t have the right to live,” Mari Kaugerud wrote on her Facebook group “Yes to the death penalty for Anders Behring Breivik,” which already has 1,783 members, the AFP reports. Dozens of similar groups have sprung up since Friday’s killings, some calling for the death penalty, others for life in prison. Breivik is accused of the initial bombing in the capital of Oslo, as well as the subsequent shooting rampage at a Labor Party youth camp on an island outside the city. He is said to be an anti-Muslim extremist who left a online manifesto before carrying out the attacks. Read more at Fox here. Read also what the Guardian has to say here. A 50-year-old South African man woke up inside a mortuary over the weekend and screamed to be let out – scaring away attendants who thought he was a ghost. His family presumed he was dead when they could not wake him on Saturday night and contacted a private morgue in a rural village in the Eastern Cape. He spent almost 24 hours inside the morgue, the region’s health department spokesman told the Sapa news agency. The two attendants later returned and called for an ambulance. The man – whose identity has been withheld – was treated in hospital for dehydration. “Doctors put him under observation and concluded he was stable,” Eastern Cape health spokesperson Sizwe Kupelo said. Mr Kupelo said the man woke up at 1700 local time (1500 GMT) on Sunday, demanding to be let out of the chilly morgue in Libode village, frightening the attendants on duty. “At first the men ran for their lives,” said Mr Kupelo. Officials have urged the public to contact doctors or the emergency services so they can they can pronounce someone dead before calling an undertaker. The Times also reports on the news Grandpa wakes up in morgue.